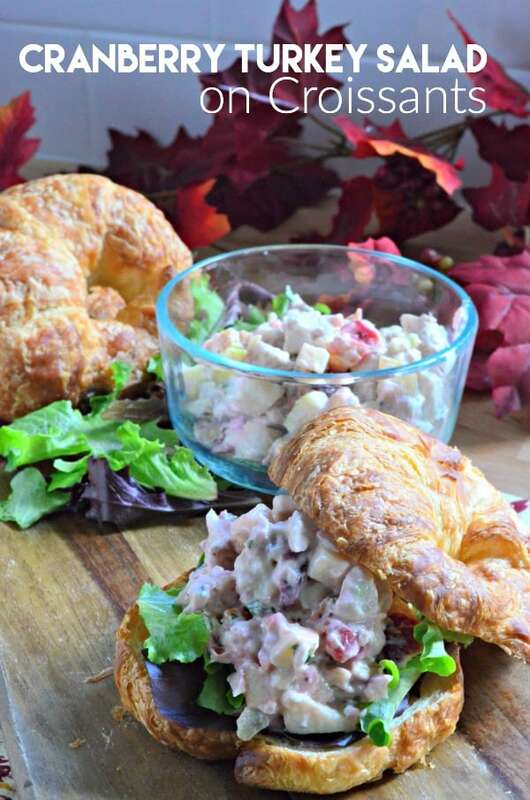 Use up the leftover turkey and cranberry sauce and wow your guest with delicious cranberry turkey salad on croissants! Happy Thanksgiving. I have so many great turkey leftover recipes that I decided to post on Thanksgiving. I’ve got another delicious turkey leftover recipe for you today. If you have a few cups of turkey leftover and at least a half cup of cranberry sauce you are in luck! Just over the past few years I’ve started to enjoy chicken salad. So it occurred to me that I should use up my leftover turkey and cranberry sauce to make this cranberry turkey salad on croissants. I had thought about making the turkey salad sans the cranberry sauce and slathering the cranberry sauce directly on the croissant. But I really wanted to taste the cranberry sauce through out. I used my cranberry mango sauce for this recipe. but you can use any cranberry sauce. I don’t think that the cranberry jelly would work for this recipe. In that case you would want to just add a slice of the cranberry sauce to the croissant and then pile on the turkey salad. I used half of a honey crisp apple to give it extra sweetness and crunch plus a stalk of minced celery. With just a few ingredients you can transform your leftovers into a magical new meal. These luxurious croissant sandwiches make for an ideal lunch or even a perfect dinner paired with a soup or salad (or both). Your family and friends will not even realize they are eating leftovers. 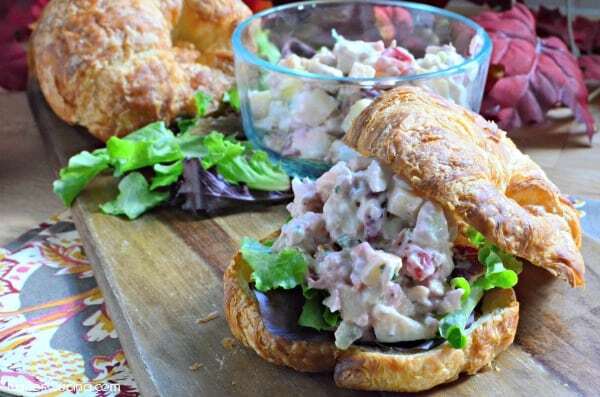 Use up the leftover turkey and cranberry sauce and wow your guest with delicious and easy-to-make cranberry turkey salad on croissants! In a large container mix together the cranberry mango sauce and mayonnaise until well incorporated. Add in the apple, celery, turkey and fresh parsley. Mix until combined. Slice in half and toast croissants. 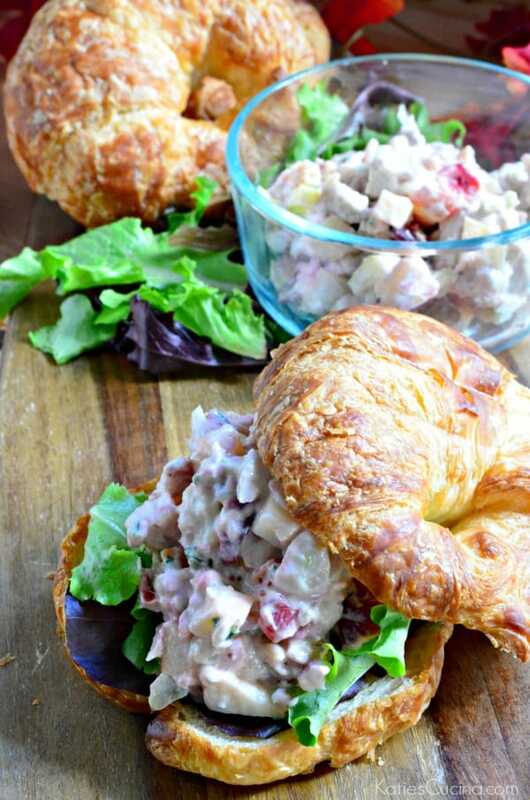 Place lettuce on croissant and 2 scoops of turkey salad. Repeat until all sandwiches are made. Enjoy! Store leftover cranberry turkey salad in a sealed container in refrigerator for up to 3 days.